Too much junk in that joker’s trunk anyway. 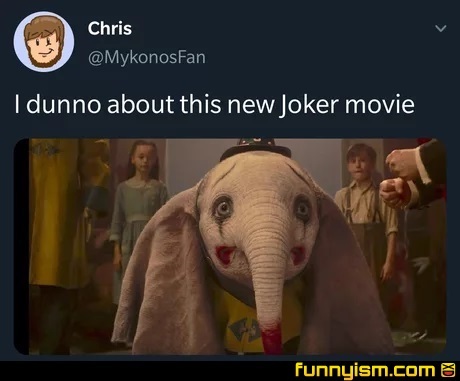 *spoiler warning At the end of the movie the power goes out and the rides are stopped full of passengers, then they eventually catch fire and collapse, a good amount of people died, that's metal Dumbo. I have to say that one of the saddest scenes in any movie has to be when his mother sings baby mine to him in the animated version. That shjt rips my heart to shreds every time. Wanna know how I got these ears? I'm not sure I'll be able to sleep tonight after seeing this pic.